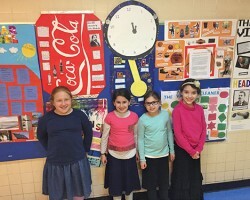 Traffic in the hallways has never been heavier, and people constantly stop to peruse the eye-catching and engaging museum of inventions that the third grade boys and girls in the JEC Lower School had produced as part of a chapter on inventions. “We always love to do inventions because they are exciting and they have a wide range of choices applicable to their daily lives,” said Suzi Kaplan, third grade boys General Studies teacher, who, along with Zeldie Henner, the third grade girls General Studies teacher, ran this project. We do limit them to doing inventions that were prior to 1990,” she continued, “because oftentimes they would end up choosing every type of i-whatever and so we try to get some really cool inventions before age of computers. It was important to construct presentations that were visually appealing, and indeed, with their prominent positioning in the main JEC Lower School corridor, students and faculty of all grades stop to look and read about the various inventions presented. Sometimes third grade students are present when they catch someone reading their report, and they stop with pride to explain.